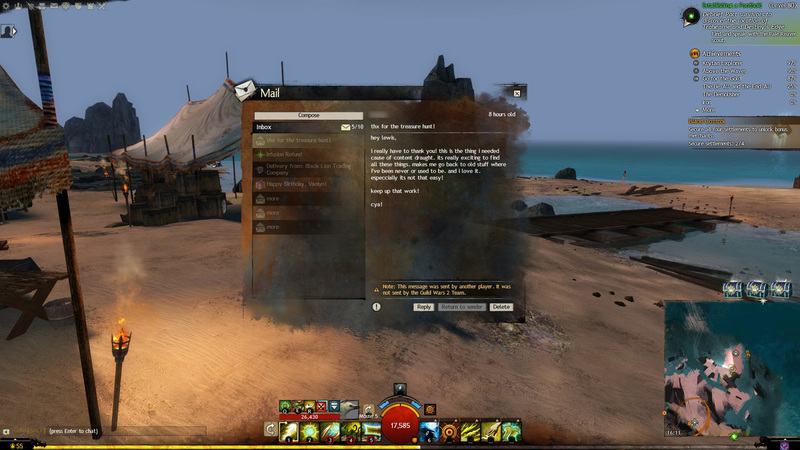 In a shocking turn of events and following the continued success of the Ten Ton Hammer Guild Wars 2 treasure hunt, Lewis Burnell (i.e me) found himself confronted with a message in Guild Wars 2 actually thanking him for the giveaway. Unsure whether he was being trolled, it turns out that the message was genuine. We asked Lewis for comment (it's me writing this by the way). "Honestly, I'm shocked. I'm used to players being pretty miserable for just about anything. To actually receive a postive message from someone, totally out of the blue, has knocked me for six. I've had to have a lie down." Although we've reached out to the user for further comment, he hasn't yet responded to our requests. Despite that, Lewis remains cautious towards community reaction. "I once received death threats for criticising Star Wars the Old Republic so anything above that would be wonderful. I think this is a one off, though." Take a look below at the message sent to Lewis.